Your out-of-the-box solution is not keeping up with your business needs? A Custom Application might be an answer. Get a fully customized Salesforce Org to adopt your business process and workflows, and grow 10x faster. Bring all you data in one place and get the intelligence that you need to be efficient and competitive. Discover how IMVU improved ROI on their Salesforce Org and increased their customer satisfaction many folds. Get a custom app built just for your business. Competitive advantage included. Get the software that you need as you change and grow. We can build anything you can imagine, but first we’ll make sure it’ll solve an expensive problem and drive business results. If you can’t find the software you need, it may not exist. We can build it for you. We’ll make Salesforce work for you to increase usefulness, adoption, and insights. Salesforce is perhaps the most powerful business platform in the world. Whether you’re a new or existing customer, novice or power user, we can help you get more out of Salesforce. 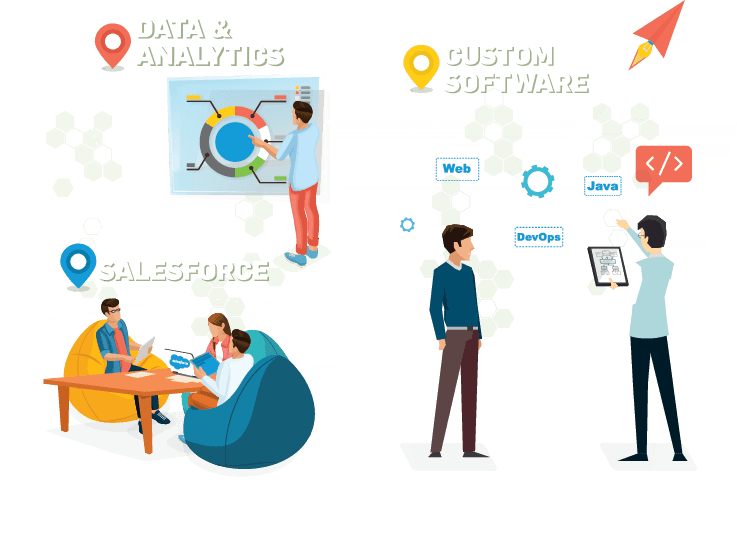 Ready to customize and extend the functionality of Salesforce to level up your business? Make faster, data-aided decisions. The competition will be envious. Real-time data for your real-time business decisions. Use the data in your business to accelerate and improve your decision-making. Having the right data in hand will lead you to the best decisions you can make now and in the future. Get the edge you need with advanced data analytics. We’ll help identify your biggest tech wins. The call is free, no sales. Let’s start with a call to discuss how to improve your technology, and where you’ll see the biggest wins. No obligation, no selling.